Fighting Ebola is all in a day’s work for Dr. Aileen Marty. The 25-year Navy veteran, now with the Herbert Wertheim College of Medicine, didn’t think twice when the World Health Organization (WHO) called her last fall and again in January to help lead containment efforts in West Africa. What drives Marty is a commitment that comes from deep within. Born in Cuba and raised in the United States since the age of 4, she credits her grandfather as a powerful influence. And so she enlisted after medical school and embarked on a career that would lead to specializations in infectious diseases, disaster medicine and the science, medical response and policy related to weapons of mass destruction. Her unique trajectory began with her studying some of the most loathsome diseases known to man, starting with the oldest: leprosy. Still, she took the assignment, inspired largely by the man who would become an early mentor. Meyers, 90, doesn’t recall any squeamishness on Marty’s part. But he does remember a hard-working young physician who joined him on trips to leper colonies, helped him hunt down African monkeys with non-lethal darts so as to test them as possible carriers and co-wrote scientific papers with him. The WHO has several times called upon Marty to take assignments around the world, and in August she began a month-long stay in Nigeria, then-little affected by Ebola but very near the line of fire. The outbreak—naturally occurring and not the product of terrorism—was first reported in March of 2014. It has resulted in the infections of more than 20,700 people in West Africa and, as of early January, more than 8,200 known deaths, mainly in Sierra Leone, Liberia and Guinea. In Nigeria Marty worked daily from dawn until almost midnight in challenging conditions to train screeners, doctors, nurses and others to recognize potentially infected persons entering the country via airport, seaport or border crossing. She also developed processes and secured needed equipment and resources. That work has paid off. 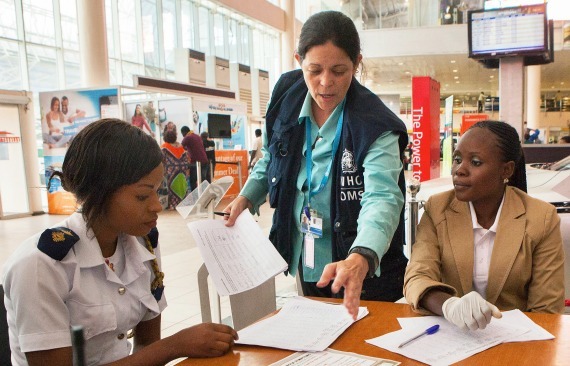 As of early January, Nigeria remained Ebola-free. But the epidemic still rages, and ending it remains a worldwide concern. The WHO estimates that $1 billion will be spent before the contagion is eradicated. Upon Marty’s return home in the fall, media flocked to hear her story. In one interview, she happened to mention the lack of precaution surrounding her re-entry into the United States: The very types of questions she had taught screeners in Nigeria to ask of incoming visitors were never put to her by customs or other officials. “Nobody had asked, nobody had cared,” Marty recalls. Within days, Marty’s comment loomed prescient. A Liberian national who had worked with Ebola patients entered the United States via Washington, D.C., before continuing on to Texas. Following the disease’s typical 21-day incubation period, the man became sick and sought treatment. He eventually died but not before two nurses who cared for him in Dallas had contracted the illness. Unworried for herself but nonetheless taking responsibility for her health, Marty had been monitoring her vital signs with a fitness bracelet, the kind that records body temperature and pulse and is available at sporting goods stores. A fever would indicate a potential problem, although that information alone is not enough to prove Ebola. And then it occurred to her: Why don’t we use such monitors on Ebola patients in the wards? Why not slap a bracelet, complete with GPS capability, on those who have been in high-risk contact with infected individuals but show no symptoms (and, therefore, are not contagious) and follow them electronically? Already 700 health care workers have contracted the disease in West Africa, where treating patients is expensive and cumbersome. The gear workers don includes an average of $100 of protective wear, such as a coverall suit and gloves, that must be discarded after a maximum-two-hour use. And the gear’s bulkiness—which impedes health care workers’ hearing, vision and manual dexterity—does not allow for a patient-centered experience. Marty introduced her idea in a CNN online op-ed and soon was contacted by an organization interested in running a pilot program. That trial launched in January with 100 patients at a treatment center in Sierra Leone. Each was outfitted with an electronic bracelet that records body temperature, oxygen saturation and other vitals. Via a free app and Internet connected specifically for the project, the staff keeps track of patients’ data. Those with “bad” numbers can be identified for additional interventions while the others continue with prescribed treatments without the burden of examination. In January Marty flew back to Africa, this time to Equatorial Guinea, a country free from the virus (not to be confused with Guinea, one of the worst hit). There she again led screening efforts, this time in anticipation of the Africa Cup of Nations, a soccer tournament typically attended by thousands. And already she is planning to tread again where many rightly fear. As early as March Marty hopes to return, this time to observe the pilot program in Sierra Leone. Her tirelessness remains but a reflection of who she is.